The Palm Sunday Procession down Church Street, Parramatta. Image: Mary Brazell/Diocese of Parramatta. A sea of colour flowed through the Parramatta CBD as young people from across Western Sydney and the Blue Mountains gathered for Catholic Youth Parramatta’s (CYP) annual Palm Sunday celebrations. View images from the 2019 Palm Sunday Procession and Mass here or below. The celebrations began at the Parramatta Town Hall with Bishop Vincent blessing the palms of the congregation, before Deacon Willy Limjap from St Patrick’s Cathedral, Parramatta read the Gospel. Before beginning the procession, Bishop Vincent spoke to the congregation about following in Christ’s footsteps. Bishop Vincent Long OFM Conv speaks during the Palm Sunday Procession at Parramatta Town Hall. Image: Mary Brazell/Diocese of Parramatta. “We are this evening joining with Christians and people everywhere in order to renew our commitment to pursue justice, peace and integrity of all creation,” Bishop Vincent said. “In Jesus, we see the God of solidarity. We see the triumph of truth, justice and love over violence and exclusion. “As we walk, let us follow the example of the Suffering Servant who shows us the way to the future – the way of disarming hatred with love, evil with goodness, violence with benevolence. “May our commitment to heal and to transform our wounded human family and our broken mother earth be brought to fruiting in accordance with God’s plan,” Bishop Vincent said. The Parramatta CBD was brought to a stand-still as Bishop Vincent lead the procession down Church Street towards St Patrick’s Cathedral, Parramatta for the 6pm Mass. 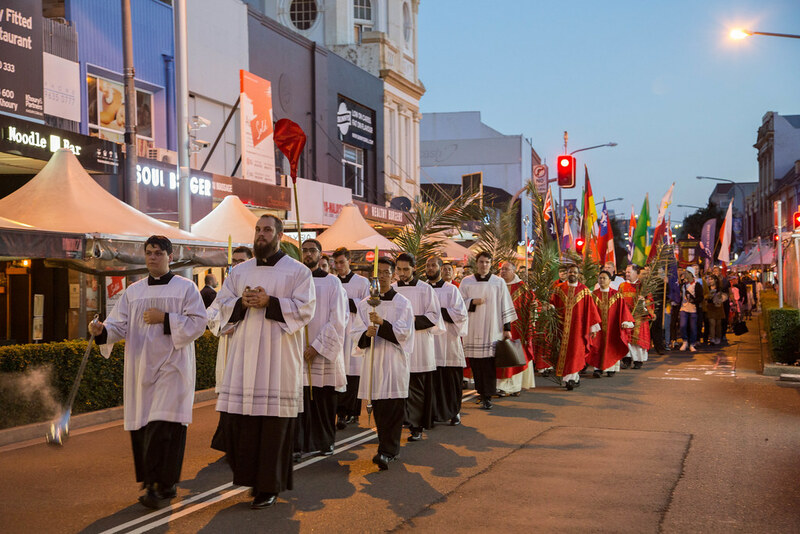 The procession, with the assistance of the Parramatta City Council and the Parramatta Local Area Police Command, commemorates Jesus’ arrival into Jerusalem to mark the beginning of Holy Week. Members of the congregation waved various national flags during the procession, accompanied by prayers and music. World Youth Day 2019 chaplains Fr Fernando Montano from St Bernadette’s Parish, Castle Hill, Fr Andrew Fornal OP from St Joseph’s Parish, Kingswood, and Fr John Paul Escarlan from Mary Queen of the Family Parish, Blacktown concelebrated Mass with Fr Christopher del Rosario from St Patrick’s Cathedral Parish, Parramatta, Fr Joseph Lam from Our Lady Queen of Peace Parish, Greystanes, Fr Joseph Maria Buckley OSPPE from St Margaret Mary’s Parish, Merrylands, and Fr Porathur Joy from St Nicholas of Myra Parish, Penrith. Following Mass, the youth gathered in the Cathedral Hall for a pizza dinner, as eight Diocese of Parramatta World Youth Day 2019 Panama pilgrims shared their experiences. Diocese of Parramatta World Youth Day 2019 Panama pilgrim Blake Bano. Image: Mary Brazell/Diocese of Parramatta. Pilgrim Mitchell Simpson said that World Youth Day encouraged him to start a youth group at his high school, which he hopes expands into his parish. Pilgrim Briana Yu told the audience that losing her luggage on route to Panama from Mexico changed her mentality and made her realise that God gave her what she needed. During the gathering, CYP announced the official opening of registrations for the diocese’s pilgrimage to the Australian Catholic Youth Festival 2019 in Perth. CYP expects between 250 to 300 young people, students and teachers will make the trek across the Nullarbor Plain to Australia’s west coast for the festival in December.